The Conservative Party has decided to sell the lease on its London HQ. The Tory party board agreed on Tuesday to move to "new, more suitable premises as soon as possible". Newspaper reports suggest leaving Smith Square in Westminster could raise £6m for the Tory election war chest. Conservative Central Office has been home to the party since the 1950s but it is 11 years since it hosted an election victory party. Announcing the sell-off, Mr Howard said he was impressed by the "unity of purpose" shown at the board meeting. Raymond Monbiot, chairman of the Conservative National Convention and deputy Tory chairman said: "The decision taken today is just one more element in streamlining the Conservative Party machine for fighting the next general election." 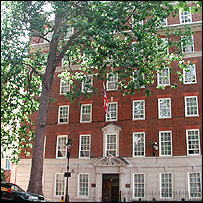 Shadow home secretary David Davis told BBC Radio 4's PM programme: "I'm afraid 32 Smith Square has got old and we need to find rather more purpose-built accommodation for modern use." Mr Davis said the party wanted somewhere with open plan offices and facilities like a television and press centre. The decision is also a symbolic move away from a building which in recent years has become heavily associated with plotting and back-biting against the leadership. Labour famously moved from Walworth Road to Millbank ahead of its 1997 election triumph, although it has now moved to Old Queen Street. The decision comes as Mr Howard's new team of shadow ministers start their first day in the job. 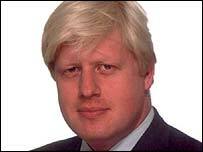 Among other changes announced on Tuesday was MP Boris Johnson, editor of the Spectator magazine, becoming a vice-chairman in charge of campaigning. Despite cutting size of his shadow cabinet by more than half to 12, Mr Howard has now given jobs to more than 100 MPs. Monday's reshuffle also saw former leaders John Major, William Hague and Iain Duncan Smith, as well as ex-chancellor Ken Clarke, form a new council of "wise men". Big winners in the changes include new shadow home secretary Mr Davis and new shadow chancellor Oliver Letwin. Tim Yeo also takes up the huge joint brief of education and health. Mr Yeo said the changes would make the Tory top team able to react much more quickly to events. The senior ministers will be backed by teams of junior "shadow secretaries". One notable absentee from the council of "wise men", Lord Heseltine, told BBC Radio 4's Today programme he would not have expected to be included in such a group and was encouraged by the start Michael Howard had made. "What he has done and the way the announcements have come through is one of the most encouraging things that has happened in the Conservative Party for a very long time. "I believe that he has recognised the fundamental fact about the Tory Party, which is that it is a broad church and to work, to be effective, to appeal widely, you have to represent a spectrum of opinion and mould it together into a fighting force," the former deputy prime minister said. The Tory chairman role has been split between Lord Saatchi, the advertising guru who helped Margaret Thatcher towards her historic 1979 election victory, and former health spokesman Dr Liam Fox. Lord Saatchi will be focusing on making Conservative Central Office a "premier political machine" once again. Dr Fox will instead be the public face of party headquarters, taking charge of campaigning, policy and media issues. Labour chairman Ian McCartney accused Mr Howard of downgrading the health and education portfolios. "While it takes two shadow cabinet members to run a declining Tory Party, apparently it takes only one to deal with the whole of the NHS and the schools system," added Mr McCartney. That critique was echoed by Liberal Democrat chairman Matthew Taylor. "Michael Howard has appointed the same old faces to promote the same old faded and unpopular policies, redirecting NHS and education funds towards subsidising those able to afford private treatment and private education," he said.